Lightning is much more complex - and extreme - than you think. As legend goes, inventor, author, and diplomat Benjamin Franklin discovered electricity in 1752 when he tied a key to a kite string and flew the kite in a thunderstorm to attract lightning. Some historians debate whether Franklin actually conducted the experiment, which he described in a letter to the Pennsylvania Gazette. Had Franklin’s kite been struck, he would have been electrocuted. Instead, the metal key channeled ambient electricity in the stormy air. Neither did Franklin discover electricity; he was the first to suggest that lightning was, indeed, electricity. Initially, Franklin and others theorized that electricity was a fluid, and lightning illuminated its flow. The kite experiment presented a leap forward, helping prove that lightning was not a fluid at all - it was simply a huge spark caused by charged electrical forces. Lightning is still unpredictable and hazardous to experiment with; physicist Georg Wilhelm Richmann died trying to replicate Franklin’s kite experiment. Today, however, technology provides safer ways to study lightning, and satellites now track the unruly electrical phenomena in the atmosphere, allowing researchers to learn more about its role in many of Earth’s processes. Lightning observations are helping researchers predict severe weather and may help pinpoint where wildfires have ignited. 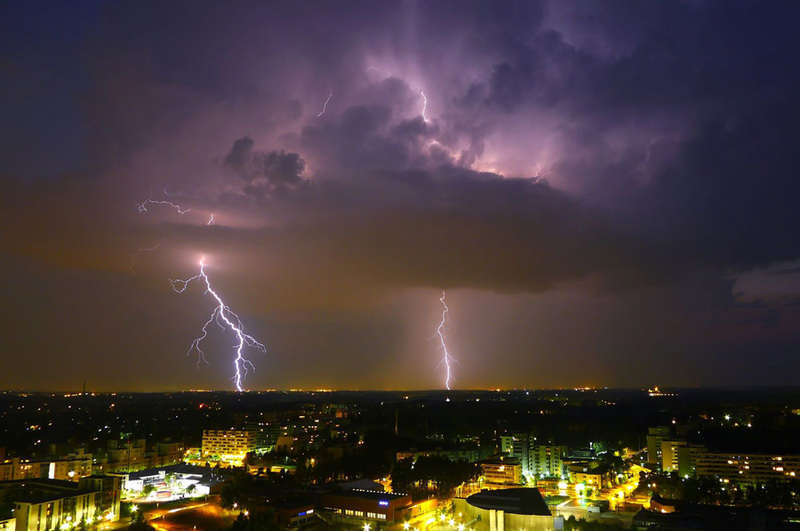 Changes in global lightning patterns may even shed light on changes in Earth’s climate. The stations are often placed in rural areas with open fields, but can also be installed in cities on building rooftops. Stations are typically networked in arrays, which detect lightning within a radius of 200 to 300 kilometers (124 to 186 miles). Yet storms frequently sweep outside an array’s range, creating gaps in lightning detection. In addition, arrays exist in only a handful of states, plus Canada, Columbia, Spain, and France. The lack of continuous coverage limited what forecasters could learn about lightning and storm development. To enable truly global lightning detection, NASA developed space-based lightning-sensing instruments. In 1997, NASA launched the Tropical Rainfall Measuring Mission (TRMM) satellite equipped with a Lightning Imaging Sensor (LIS). The TRMM LIS tracked lightning in a narrow band around the equator spanning 38 degrees North and South, a range that covered the entire length of the African continent, but missed many Northern Hemisphere countries. Like a powerful camera, LIS captured lightning flashes at about 500 frames per second, permitting researchers to follow the evolution of each flash in detail. A new identical LIS instrument aboard the International Space Station (ISS) extends the TRMM LIS record and increases the swath of observations to 54 degrees North and South, which includes the contiguous United States and more of Europe and Asia. TRMM and ISS LIS standard, science quality data are both available at NASA's Global Hydrology Resource Center (GHRC) Distributed Active Archive Center (DAAC). Near-real time ISS LIS data are available through NASA's Land, Atmosphere Near real-time Capability for EOS (LANCE). “It’s challenging our view of lightning,” Peterson said. “Back in the olden days, the American Meteorological Society defined a lightning flash as just a series of electrical discharges within a very specific point in time and space.” Now, satellite sensors catch extreme flashes that span surprising distances. “A flash might begin close to Baltimore and might terminate in New York City, affecting four different states along its path,” Peterson said. In another case, Peterson and his colleagues mapped a bolt with 234 visible branches. These long and often long-lasting extreme flashes can illuminate how storms intensify. “By looking at how the lightning is changing, we can also get a sense for how the storm is changing,” Peterson said. During initial stages when storms are smaller, lightning tends to occur as single flashes that light up a large portion of the surrounding sky. This is because light can more easily escape from smaller storm cells. As storms intensify and increase in size, flashes become more complex, and when viewed from the ground, burgeoning storm clouds may dim or shield parts of the lightning flashes. “You get a transition from these large and stationary types of lightning flashes, which look like LEDs blinking in the middle of the cloud, to these horizontally extensive long lightning flashes,” Peterson said. Satellite instruments can see through clouds to track how flashes become extreme, developing not just vertically, from cloud to ground, but horizontally, from cloud to cloud. Monitoring this transition could help forecast severe storms. Peterson and other researchers use a combination of LIS, lightning mapping arrays, and other remote sensors, like the Geostationary Lightning Mapper (GLM), to better understand how lightning and storms develop and evolve together. 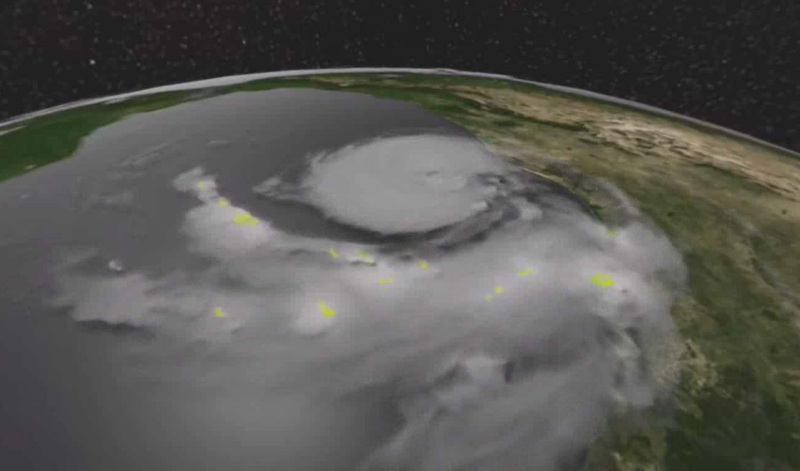 In fact, researchers have used ISS LIS lightning data to watch squalls strengthen into storms as they sweep across the United States, and followed Hurricane Harvey as it intensified over the Gulf of Mexico in August 2017. 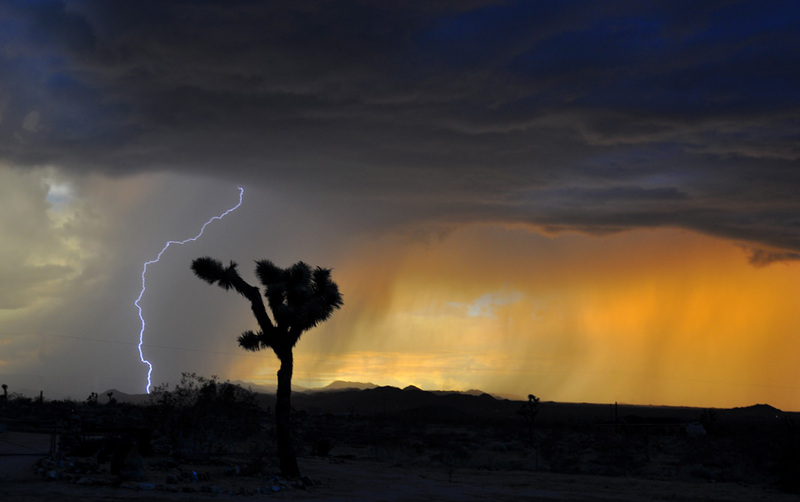 Although stormy weather often brings much needed rain to arid regions, lightning carries the risk of wildfire. Phil Bitzer, a researcher at the University of Alabama in Huntsville, uses LIS to help identify lightning flashes that may have caused fires. “We noticed something peculiar about the flashes we were seeing,” Bitzer said. “These were actually flashes with something that we call continuing current.” Normally, a lightning flash has a flickering quality, appearing to turn off and on. But these peculiar flashes stayed on for a while longer, exhibiting continuing current. “With normal lightning, when it strikes a tree, the current doesn’t last long enough to initiate a fire,” Bitzer said. When continuing current lightning strikes a tree, however, the current remains on long enough to heat a tree to its combustion temperature and erupt in flames. “That’s why these peculiar flashes are so important to detect,” Bitzer said. LIS and GLM are especially useful for identifying continuing current flashes. 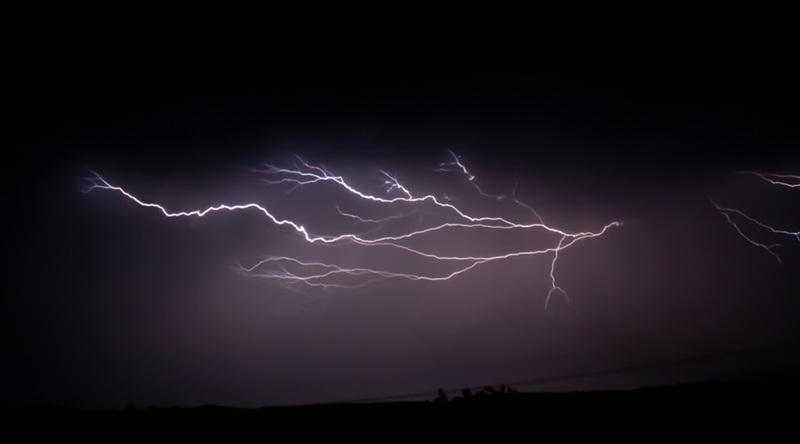 Bitzer and his colleagues hope to develop an operational system to flag continuing current lightning against a backdrop of other meteorological data. With enough warning, scout teams or drones could pinpoint exact locations to monitor for potential fires, making it easier to quench wildfires before they spread. Even though researchers do not completely understand all the interactions and potential climate connections, TRMM and ISS LIS have generated a growing lightning time series, which researchers continue to learn from. “There’s so much great work that we’ve been able to do with TRMM LIS over the years,” Bitzer said. “It was the first real climatology of worldwide lightning data.” Like Benjamin Franklin, lightning researchers are not just thrill seekers or storm chasers—they too hope to harness the power of lightning. But instead of summoning it from the heavens, they can safely watch and learn from high above. Blakeslee, Richard J. 1998. Lightning Imaging Sensor (LIS) on TRMM Science Data. Dataset available online from the NASA Global Hydrology Center DAAC, Huntsville, AL, U.S.A. doi:10.5067/LIS/LIS/DATA201. Blakeslee, Richard J. 2017. 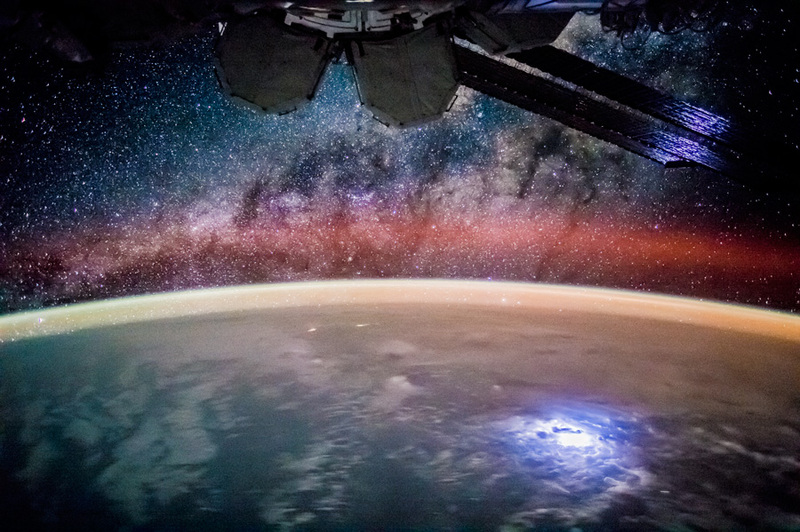 Non-Quality Controlled Lightning Imaging Sensor (LIS) on International Space Station (ISS) Provisional Science Data. Dataset available online from the NASA Global Hydrology Center DAAC, Huntsville, AL, U.S.A. doi:10.5067/LIS/ISSLIS/DATA204. Blakeslee, Richard J. 2017. NRT Lightning Imaging Sensor (LIS) on International Space Station (ISS) Provisional Science Data. Dataset available online from the NASA Global Hydrology Center DAAC, Huntsville, AL, U.S.A. doi:10.5067/LIS/ISSLIS/DATA205. Peterson, M., S. Rudlosky, and W. Deierling. 2017. The evolution and structure of extreme optical lightning flashes. Journal of Geophysical Research: Atmospheres 122: 13,370-13,386. doi: 10.1002/2017JD026855. Yanoviak, S. P., E. M. Gora, J. M, Burchfield, P. M. Bitzer, and M. Detto. 2017. Quantification and identification of lightning damage in tropical forests. Ecology and Evolution 7: 5,111-5,122. doi:10.1002/ece3.3095. Yanoviak, S. P., E. M. Gora, J. Fredley, P. M. Bitzer, R.-M. Muzika, and W. P Carson. 2015. Direct effects of lightning in temperate forests: a review and preliminary survey in a hemlock-hardwood forest of the northern Unites States. Canadian Journal of Forest Research 45: 1,258-1,268. doi:10.1139/cjfr-2015-0081. LANCE ISS LIS data are only stored for seven days and are not archived.